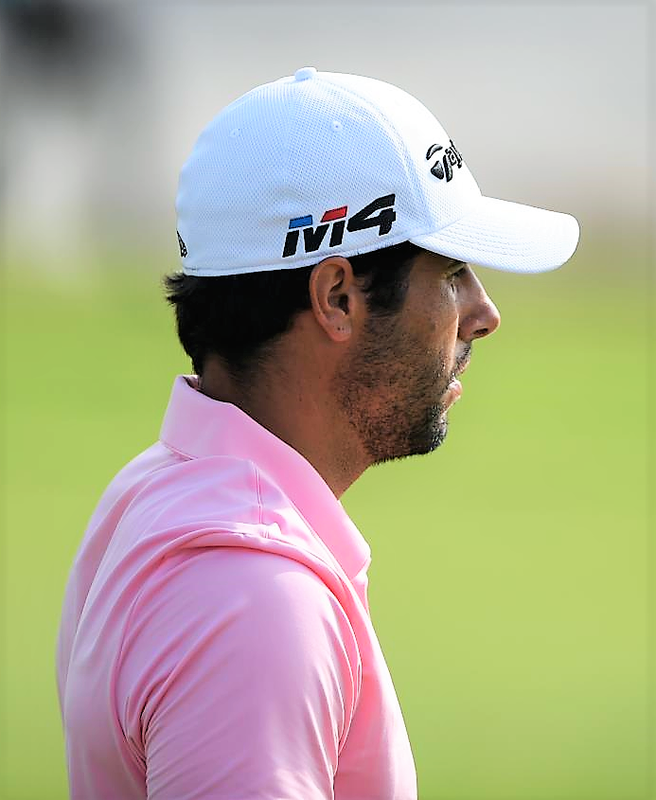 Adrian Otaegui produced a show-stopping finish to sit at the top of a congested leaderboard and take a one-shot lead into the weekend at the Commercial Bank Qatar Masters. 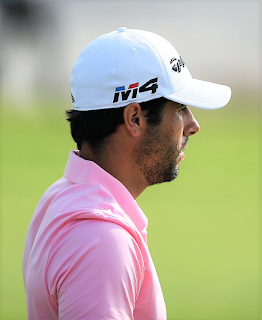 The Spaniard, pictured, made birdies on the 16th, 17th and 18th to sign for a 66 at Doha Golf Club and get to 11 under 133, leading the way from Scot Stephen Gallacher, Frenchman Grégory Havret, England's Eddie Pepperell and South African Erik van Rooyen. There were then 33 players within five shots of the lead as the low scoring continued in uncharacteristically low winds in the Qatari capital. Otaegui won his first European Tour title at last season's Saltire Energy Paul Lawrie Match Play and has developed into one of the most consistent performers on Tour, making his last nine cuts. He opened with a bogey-free 67 on Thursday and went one better in round two, making a single bogey as he leapfrogged Van Rooyen who had set the target in the morning. The 25 year old birdied the first and seventh and found some momentum with two gains after the turn but then dropped a shot on the 13th before his big finish. He hit a nice approach into the 17th, a stunning tee-shot to six feet on the par three next, and then got onto the green in two and down in as many shots on the par five last to lead the way. "I think it was similar out there today to the first round," he said. "There was no wind, it's a low-scoring course this year so I think there was no real difference in the first two days. "I know I'm playing well, I'm confident with my game at the moment and I'm just trying to keep my momentum going. After a birdie on the tenth and a bogey on the 13th, Van Rooyen looked in danger of slipping back but a run of four birdies in a row from the 16th catapulted him up the leaderboard and a tee-shot to 18 feet on the par three third handed him a two-shot lead. Oliver Fisher and Sean Crocker both joined him at nine under and set the clubhouse target but the 28 year old birdied the par five last to hit the front on his own. Pepperell and Havret had held a share of the overnight lead and they both carded rounds of 69 in the afternoon to remain side by side. Havret stayed bogey-free for the week, making birdies on the 12th, 16th and first, while Pepperell recovered from a bogey on the sixth with an eagle on the tenth and gains on the 16th and last. Gallacher was unblemished in his 66, the highlight being a 50-foot putt on the 13th to add to birdies on the first, fourth, ninth, 14th and 17th. South African George Coetzee also signed for a 66 to sit in a group at nine under that also included American Sean Crocker, England's Oliver Fisher, German Sebastian Heisele and Spaniard Pablo Larrazábal. Crocker eagled the 16th and last in a spectacular end to his 68, while Heisele also picked up two shots on the 18th in matching his score. Fisher signed for a round of 69 in the morning, with Larrazábal posting a 67 from the second wave. France's Raphaël Jacquelin made the third albatross on Tour in four weeks when he holed a two-hybrid from 245 yards on the tenth to sit at eight under alongside countryman Mike Lorenzo-Vera, Spaniards Gonzalo Fernandez-Castaño and Alvaro Quiros and England's Ryan Evans.